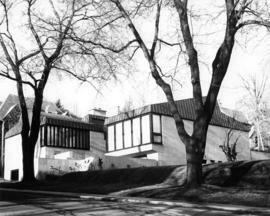 Folder consists of 4 black and white photographs of the Beaton Residence located in West Vancouver, B.C in September 1971. 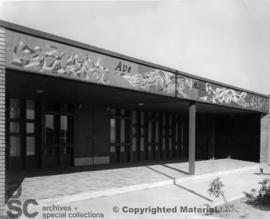 The architect on the project was Arthur Mudry. 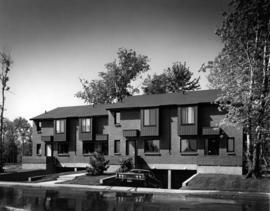 Folder contains 4 b&w photographs of the Gold River Apartments in Vancouver, B.C. 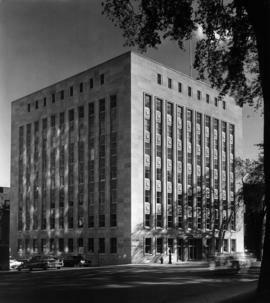 The architect was Fred Thornton Hollingsworth. 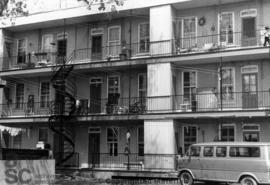 Folder contains 1 b&w photograph of the Frank Stanzyl Apartments in Vancouver, B.C. 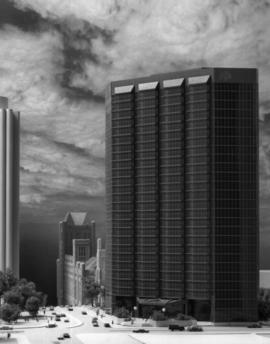 The two towers with a total area of 32,500m2 will house 294 units, including 8 luxury penthouse suites and an extensive recreation facility. Architectural drawing from Robert Turecki Architects. 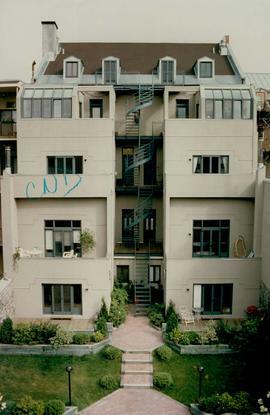 Exterior view of a mid-rise apartment building. Photograph is stamped "Photograph by Leonard Tomiczek Photography", and also "Received Mar 2 1961 Jackson Ypes Associates". Exterior view of a mid-rise apartment building, in red brick, located at 25 Henry Terrace in Toronto. 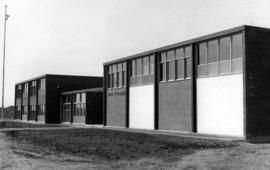 The building is constructed of four blocks, attached by elevated walkways, and houses residential apartments as well as a Catholic school. 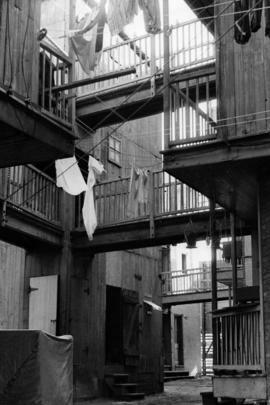 Exterior views of a two-storey brick townhouse complex, with one view of a shopping arcade on the main level of a section of the buildings. Illustration of a housing complex with brick high-rise tower and townhouses, constructed at 260 Heath Street West in Toronto. 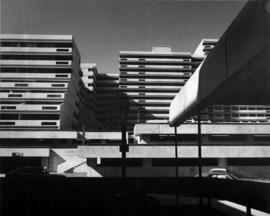 Exterior views of a high-rise apartment building with concrete balconies, and one photograph of the model. 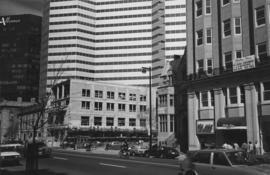 One photograph of the streetcorner (in colour) shows a 3-dimensional geometrical sign. Exterior photographs of brick townhouse complex, showing walkways and lawns. 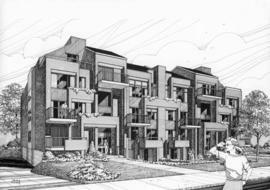 Construction of a townhouse/apartment complex with 4 storey apartment building and adjacent rowhouses. 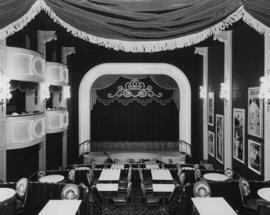 Both interior and exterior are pictured. Interior and exterior views of a single family dwelling, a Queen Anne Victorian townhouse with third storey addition and 1960s interior remodeling. Rounded, stuccoed walls and wood panneling can be found in the interior. 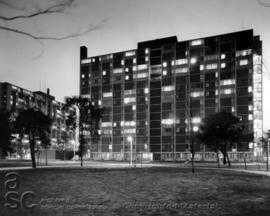 Interior and exterior views of apartment building. Aerial view of the apartment tower, showing Humber river and nearby Old Mill Inn. 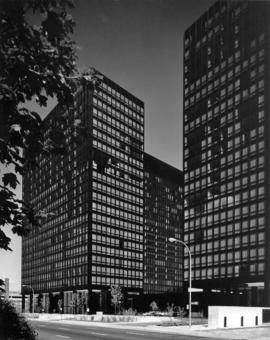 A stamp on the back of the photograph gives the architect as Raymond Mandel, and the photographer as Jack Mitchell. 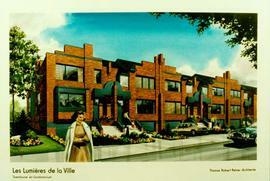 Exterior views of the townhouse complex, showing yards and patios, parking and courtyards. 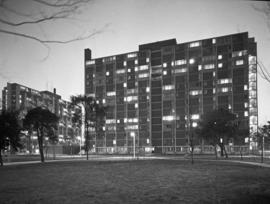 Photograph of a low-rise residential co-operative housing complex located at 1974 Victoira Park Avenue in Toronto. 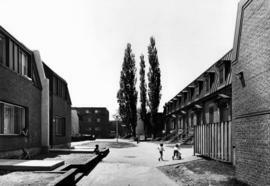 A piece of paper adhered to the verso of the photograph gives deails of the 1962 CHDC National Award competition for Multiple housing. 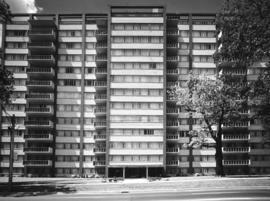 Photographs of the exterior of a planned community in Toronto, with both high rise and townhouse structures. 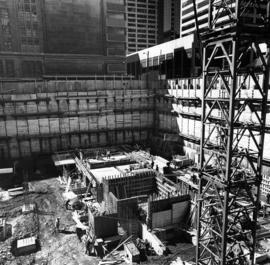 Views of the highrise block under construction. 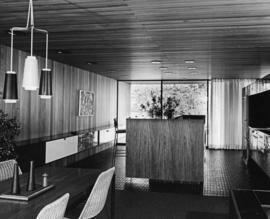 One interior view of a living room and dining room inside one of the two-storey townhouses. Exterior view of two high rise towers, taken from across a field. 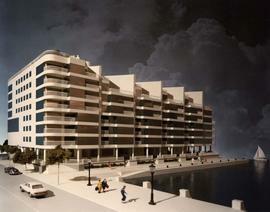 Architect's model and exterior view of finished high rise residential condominium located at 480 Queens Quay West in Toronto, designed with stepped levels and walls of glass windows. 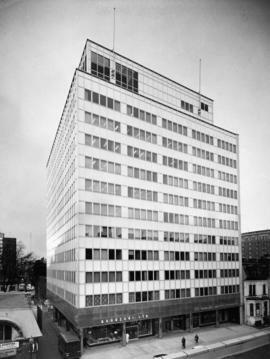 Photograph of a design concept drawing for the McMurrich Street Condominiums, a joint venture by the Cadillac Fairview Corporation Limited and Belmont Construction Company Limited. A piece of paper is taped to the back of the photograph. 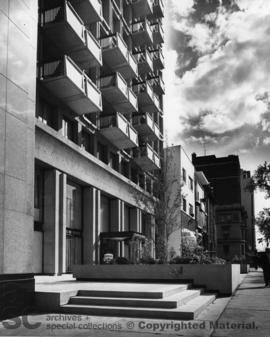 Exterior views of a modern residential high-rise building in one of Toronto's oldest residential districts. Aerial view of the 51 storey mixed-use office and residential tower located at 44 Charles Street West in Toronto. File consists of 38 images of the inside of suites in the 500 QQ condo building, at 500 Queens Quay West. Designed by KPMB Architects. 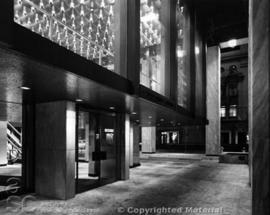 File consists of 38 images of the 500 QQ condo building, at 500 Queens Quay West. Designed by KPMB Architects. 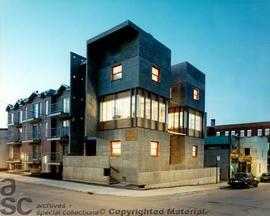 File consists of 32 photographs of projects completed by Quadrangle Architects in Toronto. These include: 5 Rosehill, GAP Bloor Street, St. James (King and Jarvis), the Candy Factory lofts, Toronto Film Studios, G & W, and the Duke condos. File consists of 21 images of the interior and exterior of a 2-story farmhouse with barn and surrounding gardens. 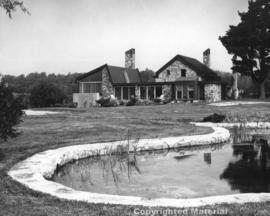 Views include kitchen, bathrooms, living room, barn, garden, and home exterior. 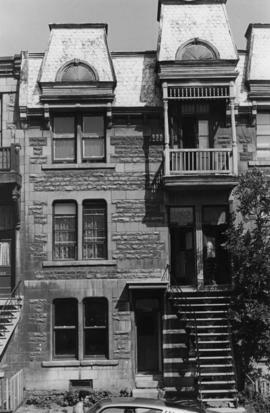 File consists of 1 image of the front of a 2-story home. File consists of 18 images of the interior of custom-built luxury homes by Quess Homes. Views include living rooms, fireplaces, a kitchen, libraries, and a bedroom. Photographs of the architect's models. 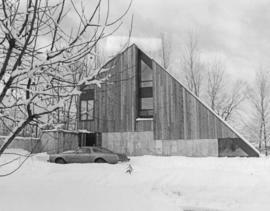 This building was given an Award of Merit by the Governor General's Awards for Architecture in 1990, and an Award of Excellence by the Ontario Association of Architects Awards in 1988. 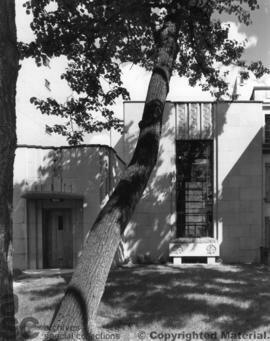 Exterior view of rectangular building with central courtyard, including one aerial view. 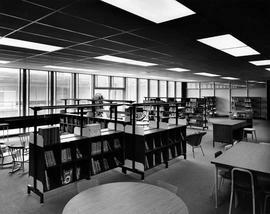 Interior view of library. 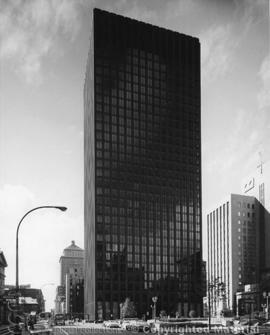 Building located at 25 Yorkwoods Gate, North York. 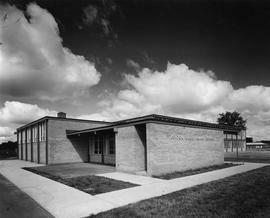 Photographs of the exterior of the two storey glass and brick building.